Often times, images speak more to me than words do, but this morning’s devotional cut right through my heart: “Our attitudes are an outward display of what’s taking place in our hearts.” Normally, we tend to regard our attitudes as an outward reflection of what is going on in our lives, but very rarely do we stop and consider that our attitudes, actions, AND words are a reflection of what’s going on in our hearts. There is so much hurt in this world – no matter who is at fault or to blame – but I am here to tell you that the healing and joy available to you far outweighs the hurt! James 1:2 says, “dear brothers and sisters, when troubles of any kind come your way, consider it an opportunity for great joy.” It may not feel like it right now, but there is joy to be found. There is light in the darkness. There is healing in the hurt. I’m here to tell you, this is a challenge for me as well. While it is a struggle some days to rejoice IN all things, it is so important to guard our hearts and our words. Hurt people hurt people. 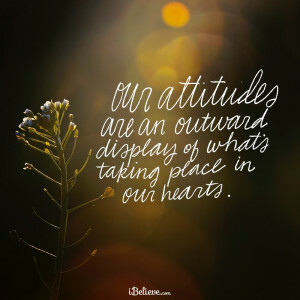 Don’t let your attitudes and actions leave a permanent mark of a temporary place you are in. Let love, peace, and joy take root in your heart so that the flowers of your soul blossom. This entry was posted in Daily Thoughts, Faith and tagged Authentic Living, be compassionate, be you, believeBIG, createBIG, dreamBIG, faith, fireinhersoul, God is Great, graceinherheart, heartonfire, I am His, laughBIG, lifeonthehorizn, live in joy, liveBIG, loveBIG, over the top, redhairdontcare, rideBIG, The Year of Choices. Bookmark the permalink.